Trekking in the tundra and a vista of the glacier tongues that lead to the infinite plateau of Inlandis. 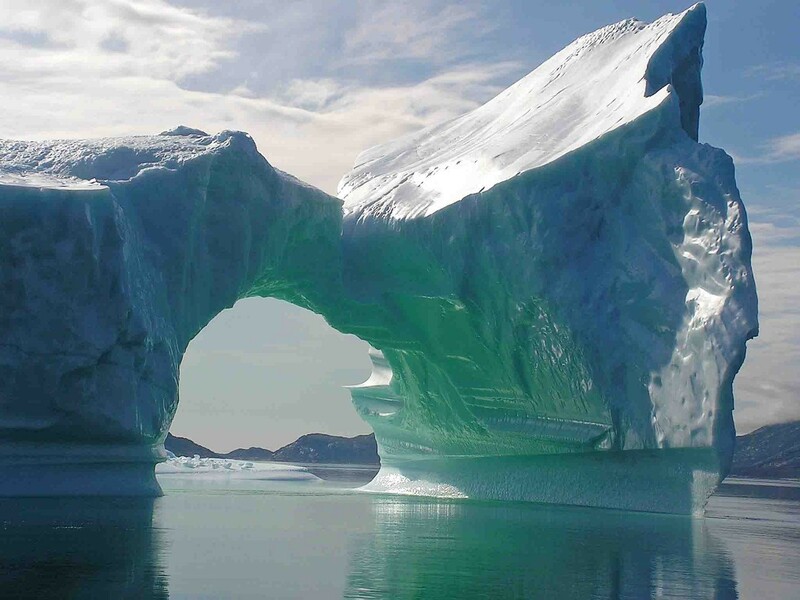 Independent sailing among icebergs and a panoramic view of the Eqalorutsit glacier. Experience the endless day (until mid-July) or see the northern lights (from mid August). Three-hour flight from Reykjavik (Iceland’s domestic airport) to Narsarsuaq (Greenland) with spectacular views of Kap Farvel and the huge southern Greenland icesheet … I’m having the window! Met by our English speaking guide at the airport, crossing the Eriksfjord by zodiac to Qassiarsuk, our base in Southern Greenland. After staying at the Leif Eriksson Hostel we have our first thrill of the journey: a guided tour of the viking ruins of Brattahlid (present day Qassiarsuk), learning the history of the arrival of Eric the Red from Iceland at this small settlement in 985 and Leiff, his son’s voyage to Vinland ( Canada) in 1000. Of particular interest are the reconstructions of a viking house (spacious but cold) and an Inuit dwelling (small but warmer), transporting us back in time to the harsh conditions in which these people lived and it definitely shows us how the Inuit knew how to adapt better to the progressive cooling of the climate. Dinner and overnight stay at the Leif Eriksson Hostel. After leaving non-essential luggage at the hostel, we cross the Eriksfjord again and start ascending the Mellem Mountains through the Flower Valley. 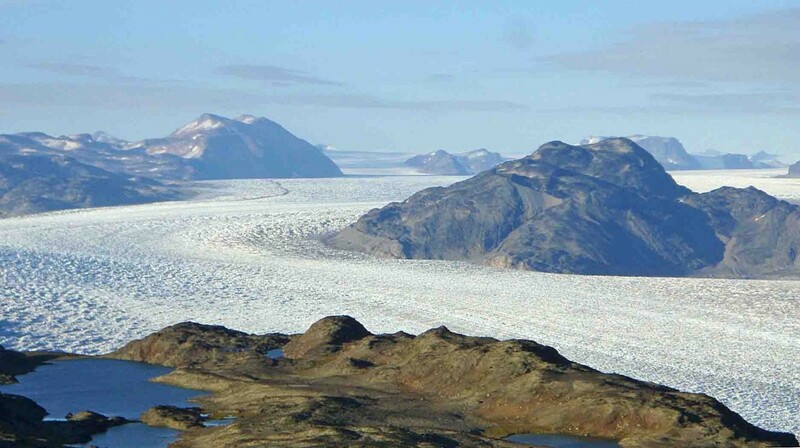 After two hours, almost by surprise, the Kiattut glacier appears at our feet, lost in the immensity of Inlandis or the inland ice-sheet of Greenland. Depending on the pace of the group, we go down to the glacier itself and walk on the million-year-old ice. The climb to the Mellem Cabin, among small lakes and tundra, takes another hour. Accommodation in tents at Mellem’s Camp. On the way back to Narsarsuaq we ascend to the highest peak in Mellem Land to enjoy one of the most exclusive views of southern Greenland: the infinite Inlandis in the distance, two glaciers falling into the sea beneath us and behind us the labyrinth of fjords where we will be kayaking in the coming days. In the afternoon we cross the Eriksfjord by zodiac straight to a hot shower at the Leif Eriksson Hostel. From there we visit the Qooroq Ice Fjord, navigating as far as the chaos of icebergs and ice sheets allow us… The Endurance! Dinner at the hostel is “traditional Inuit”, with a sampling of some of the tastiest Greenlandic dishes. Overnight stay at the Leif Eriksson Hostel. 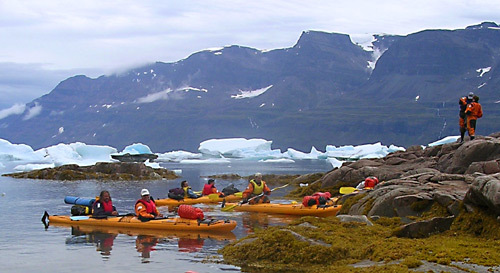 In the morning, after leaving luggage not necessary for kayaking at the hostel, we start trekking towards the farms in Tasiusaq, an idyllic spot located at the foot of the Sermilik Fjord, always full of icebergs, as the backpacks are transported by jeep. Ten minutes from our hostel in Tasiusaq is the yurt (Mongolian tent) with the kayak equipment. After selecting waterproof clothing and navigation accessories we make first contact with the water in the small bay of Tasiusaq and get to know the basics of security. Overnight stay at the Hostel in Tasiusaq. Always following the guide, the experiences are unforgettable: navigating through the ice, and on many occasions among gigantic icebergs, the noise made by moving icebergs, seals heads suddenly appearing or kayaks slicing silently through the water. 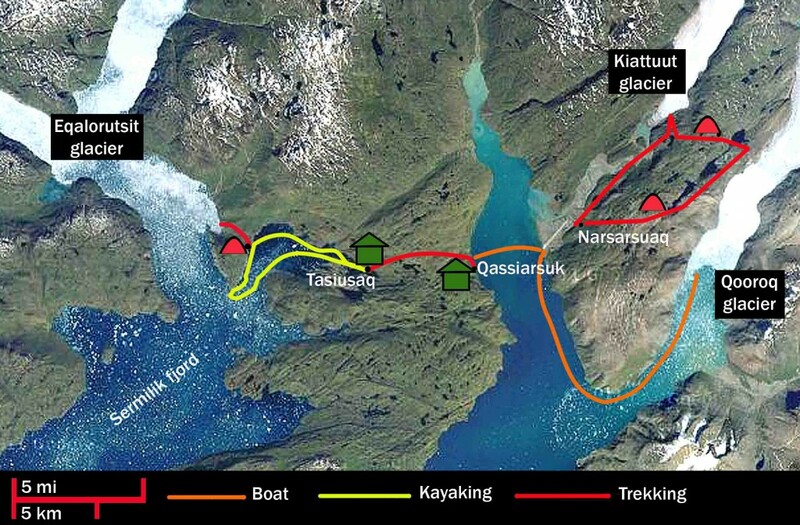 We weave from shore to open water to avoid icy barriers, we stop for lunch at small islands or on the coast if the group wants to… there’s no rush, our goal is about ten km west along the Sermilik Fjord to reach an isthmus where we set up camp. From there, we will take a short walk to the other side of the isthmus to admire the stunning view of the Eqalorutsit glacier: Now I understand why there were so many icebergs! Camping overnight. In the morning we head off to Qassiarsuk while our backpacks are transported by jeep. Once in Narsarsuaq we recommend you visit the Museum of the American Base, the Bluie West One, untouched since the Second World War. Flight Narsarsuaq to Iceland (Reykjavik airport) or Copenhaguen. From 10th – 17th September. This is a fairly active trip for which some level of physical fitness is necessary or have the habit of hiking in the countryside. As for the kayak, as we will be sailing in an area of calm water and due to the stability of our double kayaks, previous experience in kayaking is not required (although is recommended).